As I’ve discussed before, my personal experience with Uber has been mixed. No doubt, due to Uber, DC taxis have stepped up their game and these days, I can typically catch a cab more quickly than waiting for Uber to arrive and pay by credit card to boot. Yet my perspective doesn’t matter because I’m raising a generation of F-UBERs – future Uber users. Both of my daughters have the Uber app on their smart phones. Which means that my college freshman didn’t have to wait 30 minutes in the freezing cold in an unsafe part of town for the next college shuttle to ride back to campus but instead, could hail an Uber for a $6 ride. Nor will she ever understand the concept of “mad money” – that $20 bill that we ’80s gals stuffed in a pocket or shoe or bra – to be extracted to pay for a cab if our dates got drunk or “fresh.” As for my younger daughter, we’re experimenting with Uber as a stand-in for days when she can’t take the bus and my schedule won’t allow me to pick her up. In short, the world that my daughters inhabit is one where an Uber is a way of life. When they graduate school and enter the work force, they probably won’t even think to catch a cab home after a light night at work; they’ll just call for Uber. Just as they’ll research a paper with Google rather than a card catalogue, make a purchase relying on online reviews rather than advice from a salesperson, or find a restaurant or repair person online rather than in the Yellow Pages. And most likely, engage professionals like doctors, lawyers or accountants differently from how it as done in the past. 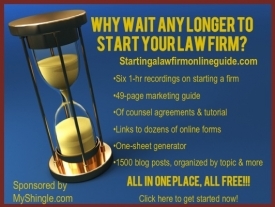 Maybe picking a lawyer based on online reviews or communicating exclusively online isn’t as prudent or effective as obtaining a personal reference from a trusted source or meeting face to face with a lawyer in a downtown office. But the benefits that come from delivering traditional legal services don’t matter if the younger generation isn’t buying. Perhaps instead of insisting that the old ways are best, we ought to focus on improving the tools that the next generation use – whether it’s increasing the accuracy of online reviews or ensuring that the unbundled or online legal services still comply with the highest professional standards.